Prime Minister Raila Amolo Odinga on Saturday witnessed the signing of cooperation agreements leading Chinese firms, covering energy and road construction projects meant for various parts of Kenya. The agreements signed in Nanchang, China on Saturday include an MOU with China Jiangxi Corporation for International Economic and Technical Cooperation to develop a solar and diesel engine power plant in the country. The agreement also provided for a concessional loan for the construction of the Mbita-Sindo-Magunga-Karungu-Masara Road and Sindo-Nyandiwa-Sori Road in both counties of Homa Bay and Migori. Another MOU between the Government of Kenya and Zhongmei Engineering Group Ltd provides for a concessional loan for the construction of Narok-Masai Mara (C12) road to connect with Narok-Mau-Narok (C57) Road. Engineer Maingi Mwangi, Director General Kenya Rural Roads Authority, and Engineer Meshack Kiddenda of the Kenya Highways Authority signed the agreements for Kenya. 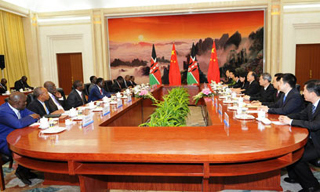 During the ceremonies, the Prime Minister also presented to the governor of Jiangxi Province of China the power plant agreement with the Government of Kenya, signed in Nairobi on 16 July. The Chinese Government has also accepted to extend to Kenya a concessional loan of US$ 72 million, for the National Optic Fibre Backbone Infrastructure Project and E-Government, which will provide fibre-optic, linking all urban areas in the country.